“Is not every unbeliever who has a reason for his atheism and his decision not to believe a theologian too? Atheists who have something against God and against faith in God usually know very well whom and what they are rejecting, and have their reasons. Nietzsche’s book The Antichrist has a lot to teach us about true Christianity.” —Jürgen Moltmann, Godless Theology. My early years as a Christian were spent in a fairly dualistic Christian culture. Creation and redemption were frequently opposed: salvation meant redemption from the world, from worldliness, from distractions and secondary things. Explicitly and implicitly I received the message that anything that was not a gospel-matter didn’t matter. Friedrich Nietzsche awoke me from my Platonic slumbers. 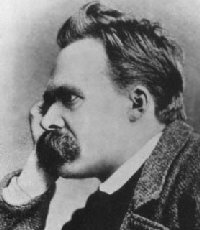 I began with Beyond Good and Evil (1886): “Christianity is Platonism for ‘the people.’” Nietzsche’s humorous, vigorous, irreverent and megalomaniac take on Western culture and thought helped me to see the world-denying resentment behind much that passed for Christian thought. Reading Thus Spoke Zarathustra (1883-85) and the Bible, I rediscovered a world-affirming faith. Not a naïve optimism, nor Nietzsche’s heroic Übermensch, but a realisation that the author of salvation is none other than the creator who declared everything “good, very good.” The God who raises the dead brings not redemption from the world, but the redemption of the world. Nietzsche seeks to vanquish the shadows of god that linger on in Western culture after it has rejected Christianity. The god he banishes is one to whom I’d also like to bid good-riddance. Nietzsche, a self-styled anti-Christ(ian), does Christians a great service through his iconoclasm. Although usually pegged as a philosopher (he briefly held a university position as a philologist), he is also able to “theologise with a hammer,” sounding out the hollow idols and ideals of the Western tradition. This task is integral to any Christian theology worthy of the name. “I beseech you my brothers, remain faithful to the earth, and do not believe those who speak to you of otherworldly hopes! Poison-mixers are they, whether they know it or not. Despisers of life are they, decaying and poisoned themselves, of whom the earth is weary: so let them go” (Zarathustra, Prologue, §3).